Based on the collective experience of Campbell & Company’s Communications team, we assembled and answered a list of annual report FAQs. Read on for everything you need to know about writing a winning nonprofit annual report. What’s the value of an annual report? Before you launch into the production of your report, your team should understand the annual report’s role and be clear on its goals. 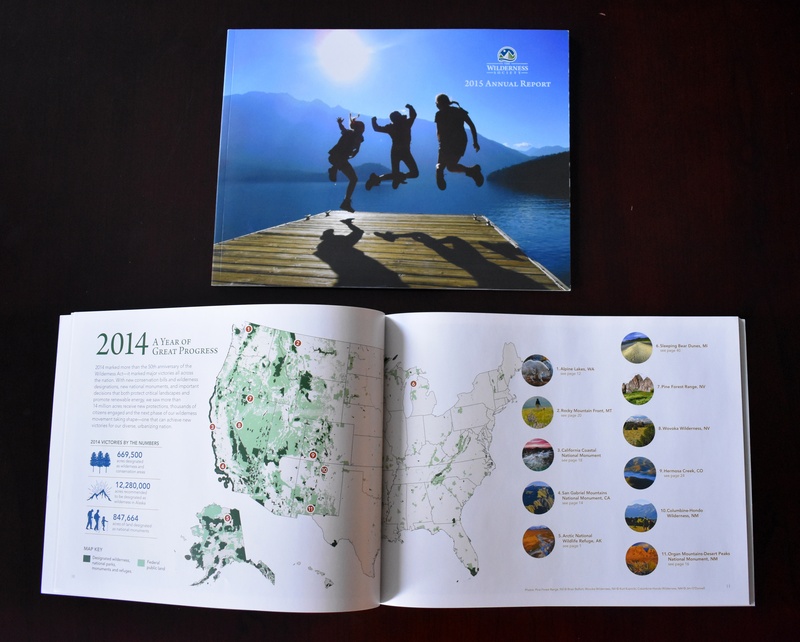 A well-done annual report is a versatile, durable communications piece. It reminds supporters why they give and how their gifts are used, it reinforces people’s connection to your organization, and it serves as an important donor touchpoint. Annual reports can also serve as a cultivation piece used in donor meetings, as well as a direct solicitation piece. In fact, our team has seen them directly spur upticks in giving: When Campbell & Company began partnering with The Wilderness Society to rework its annual report as a donor-centered communications piece, there was an immediate increase in number of gifts received, as well as average gift size and total giving through the included response card. Who’s the ideal target audience? There’s no one-size-fits-all target audience for annual reports. Your audience will depend on how you plan to distribute and use the report. An annual report doubling as a major donor cultivation piece and one designed to garner attention from the wider community will naturally have different target audiences. The key is making sure you define the audience at the outset, whoever they may be. What should we include in our report? The progress section is generally the most distinctive of the four. It gives you a chance to flex your creativity and show off your brand personality, whether you choose to do so through infographics, program narratives, personal stories, or rallying-cry messages—or something else entirely. The answer to this question will be a little different for each organization (are you sensing a theme? ), but there are certain key players who are usually involved. The head of development typically leads the charge with buy-in and oversight from the CEO and often, the board chair. Many development teams coordinate with marketing to produce the report. Program staff also play a crucial role in report production. Think ahead about what information you will need from them—high-level data, individual stories, etc.—and build in time in your process for program staff to collect information, coordinate interviews, and review the report. Keep in mind, however, that while broad input is good, writing by committee is not. Be thoughtful about how and when you involve different individuals, who needs to review for accuracy and who needs to review for content, and how you can best move toward a final product with a strong, coherent voice. Expert tip: Be strategic about who you feature in the annual report. Interviewing a top donor for a story can be a meaningful cultivation step. Do you have tips for writing an effective annual report? The most memorable and compelling annual reports weave in a unifying theme. How would you characterize the past year? What was the focus? Did something of consequence happen at your organization? Ask yourself these questions to help uncover that central theme. 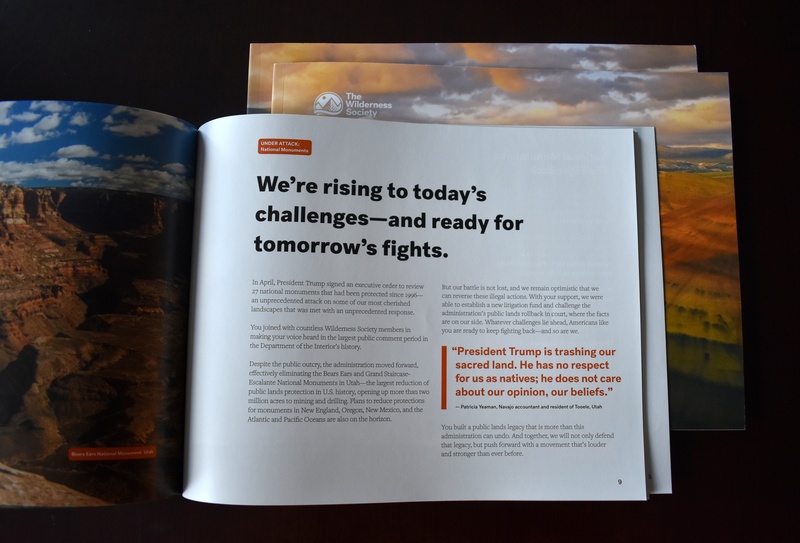 The Wilderness Society thinks carefully about its annual report theme each year. In 2017, its “Our Wild. Our Climate. Our Future.” theme captured its cause in a crisp, compelling way—both in tone and content. It also spoke to its heightened importance under the current presidential administration. The YMCA of Greater Seattle opted to use the same name as its campaign for its 2017 annual report: “Opportunities for All.” This is the lens through which the Y views the value of all its work—and it gave development staff the chance to talk about the success of the campaign so far. Throughout the report, and especially within the progress update, focus on high-level messaging rather than details, end results rather than process. You want readers to remember your weightiest accomplishments, not the intricate path you took to get there. To drive home your impact, share human-centered stories and quotations as well as overarching program data. Make sure to include donor support in this narrative, and remember to emphasize the work of staff, as well. Above all, write for the reader. Harness your theme and your brand personality to tell a story that they care about. While you hope every supporter reads your report cover-to-cover, it’s important to recognize that most readers will skim it. Make ample use of headlines throughout the report and write them so a casual reader can get the gist just by scanning those high-level messages. Expert tip: Work smart by repurposing past content in your annual report. Speeches can help you craft the introductory letter, and recent donor communications can jumpstart the progress section. After you publish the report, repurpose the new stories you collected on your website or in other donor cultivation or stewardship pieces. How can we use design elements to take our report to the next level? Form follows function when creating an annual report: Design your report based on how you intend to use it. One organization’s annual report may be a purely digital piece, and its team might create an annual report microsite. Another organization may use its report as direct mail, complete with an insert for gifts. Whatever format makes sense for your audience and goals, strive for a visually appealing report. Use infographics and data visualizations to add interest and break up text. Pages (whether print or web) should be light on copy and heavy on images. If you have the budget to support it, don’t be afraid to try a more creative design. 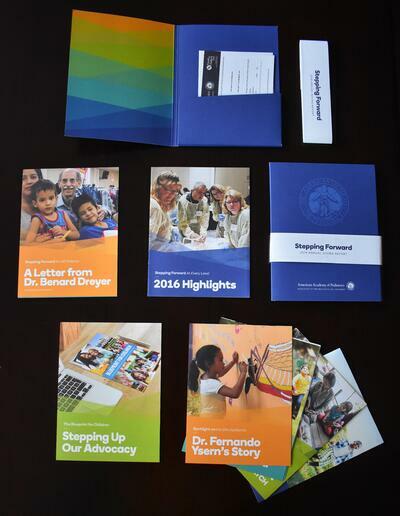 For the American Academy of Pediatrics’ 2015 annual report, we created the report in the form of a stack of “cards” and mini-booklets that go into a cardboard sleeve sealed with a paper wrapper. Some of the items were just single cards printed front and back, some were mini-booklets or fold-outs, and the donor list was a more substantial booklet—all folding up to the same format size. The special, distinctive design helped capture the attention of attendees and make it easier for them to carry it around at their annual conference, where it was initially distributed—and its flexible format allowed AAP’s development officers to customize the report to specific donors by removing cards and/or adding collateral. We published our annual report. How can we evaluate if it’s made an impact? Evaluating the effectiveness of such a broad communications piece can seem daunting, but it’s doable. After you send out or go live with the report, monitor your giving numbers for an uptick in donor support. Did you receive gifts in response to your direct mail piece? These could come from the insert cards, but some donors may decide to make an online gift after reading your report. Was there a bump in support from a specific email CTA or donation link on your annual report webpage? Use analytics as much as you can to track this impact. As you’re sifting through these hard numbers, remember that the annual report can have less tangible benefits. This value is harder to track and quantify but no less important for your organization. Talk to your board members and other close supporters to gauge their reaction and the reaction of their peers. Did they read it? Are they sharing it with others? Your team can learn volumes from these informal conversations. Producing an annual report takes lots of planning, collaboration, and hard work—but reminding your supporters why they care is well worth the effort. If you have more questions, feel free to leave a comment below or contact Pat or Susannah directly. Pat Chesnut and Susannah Young are Senior Consultants with Campbell & Company’s Communications team. 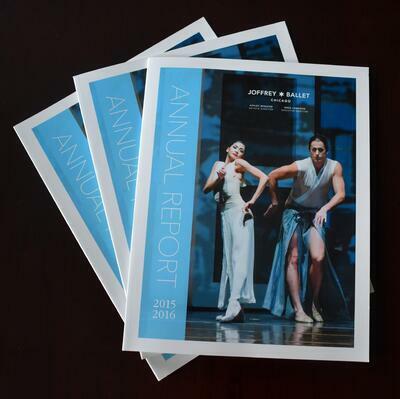 They have collaborated on several annual reports for clients, including The Wilderness Society, the American Academy of Pediatrics, and the Joffrey Ballet.